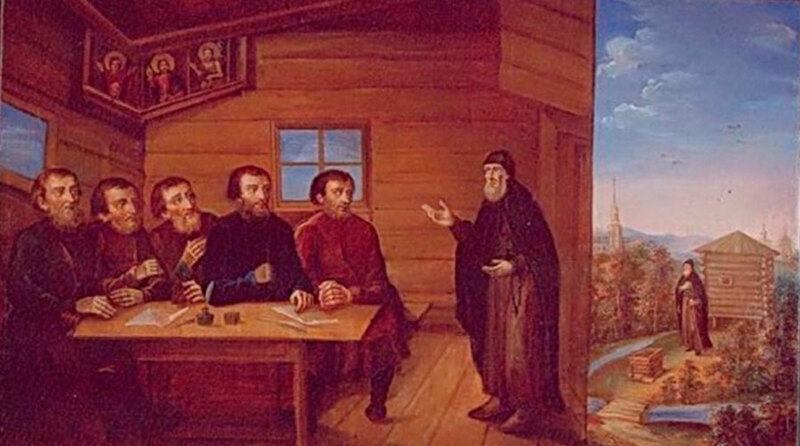 Fearing the wrath of Tsar Ivan the Terrible, kinsmen of the disgraced prince Ivan Ivanovich Belsky secretly brought his seven-year-old son Gabriel to the city of Staritsa. In the years of his growing up, and seeing the malice of the Tsar towards his family, the young prince withdrew to Vologda and lived with a shoemaker, from whom he learned the cobbler’s craft. His marriage did not last long, for his wife soon died, leaving Prince Gabriel to raise his infant daughter. The adversities of his earthly life strengthened in him the intent to devote himself to God. 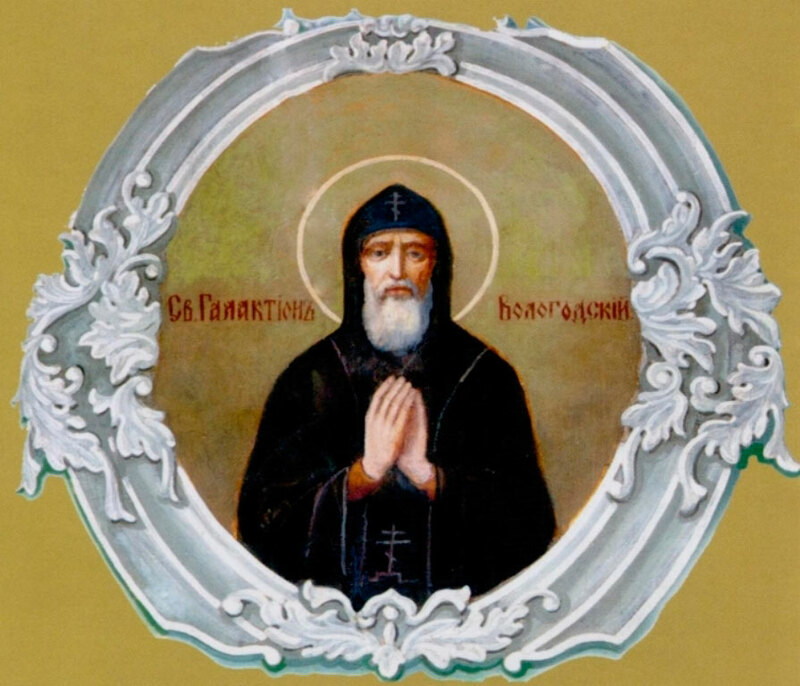 Having sought out a place at the River Sodima, he dug a pit and made his cell near a church named for the Most Holy Trinity. After being tonsured with the name Galaction, he began to labor in fasting and prayer. The ascetic did not give up his cobbler’s trade, and the money which he received from the work was divided into three portions. One part he dedicated to God, another portion he gave to the poor, and the third part he kept for his own needs. Advancing in spiritual life, Saint Galaction secluded himself in his cell, chaining himself to the wall. God-fearing Christians gave him food through a small window. The ascetic rested little, on his knees and holding on to the chain, and he ate only dry bread and water. In the cell of Saint Galaction was nothing but the old matting with which he covered himself. People soon began to come to the hermit for spiritual guidance. He received both the rich and the poor, and his words were filled with spiritual power. He consoled the grieving and brought the proud to their senses. In prayer Saint Galaction achieved a special spiritual grace. 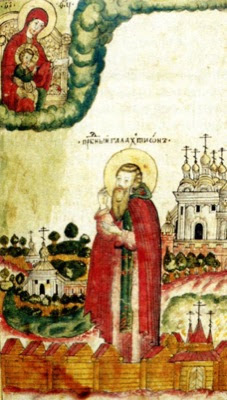 Once, when the Vologda region had gone a long time without rain, Bishop Anthony came to the Church of the Holy Trinity with a church procession and sent a request to the hermit to come and pray with everyone for deliverance from the common woe. 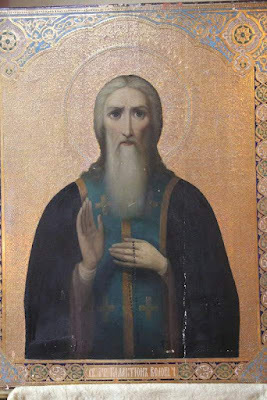 Saint Galaction obediently left his cell and prayed in the church, and the Lord sent abundant rain upon the parched earth. The prophecy of the venerable one was soon fulfilled. In September 1612 the Polish and Lithuanians stormed into Vologda, and they killed many of the inhabitants. They defiled and plundered the churches of God, and they set afire the city and its surroundings. As Saint Galaction predicted, the house and church built by Nechai were burned, as was also the city church named for Saint Demetrius. Saint Galaction was murdered by the invaders on September 24, 1612. Pious Christians buried the body of the venerable martyr in his cell. Over the place of his burial miraculous healings began to occur. In the time of Bishop Barlaam (1627-1645), a church was built in honor of the Sign Icon of the Mother of God over the relics of the venerable martyr Galaction, and a monastery was founded. With the blessing of Archbishop Marcellus (1645-1663), a cathedral church was built at the monastery in honor of the Holy Spirit, and the monastery took its name from this church.